IDEAL FOR HOME AND THE SMALL WORKSHOP, Correct grinding and honing is an art in itself. Without training and experience, costly mistakes can be made and expensive tooling ruined. 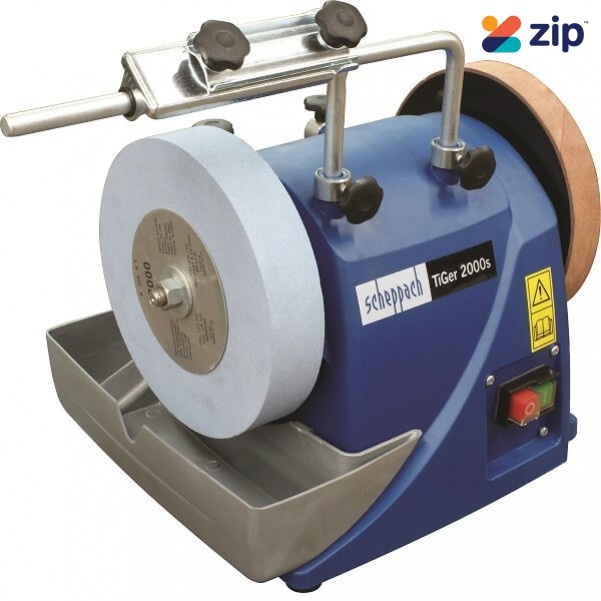 This Wet stone sharpening system offer superb, professional results and a razor sharp finish every time. With total accuracy and sharpening efficiency this Wet Stone sharpening system is easy to use even for a beginner. Ideal for the home and small workshop and with a comprehensive range of accessories, it is perfect in producing sharp cutting edges to knives, scissors and tools. Extensive accessories are included with the standard equipment: The Ø200mm Wet stone Sharpening System offers superior technology for professional results every time - even if you are a novice. Industrial induction - type motor for long lasting smooth performance. Break - proof water tank. Removable leather honing wheel. After Sharpening, it removes the burr to give you a smooth edge. Includes a special stone containing grains of aluminium oxide to achieve the perfect grinding results at a much faster time, also ideal for HSS tools.